Last night, my friend gives me the link in facebook about the latest seating plan of G-Dragon 2013 1st WORLD TOUR CONCERT: One of a Kind Live in Malaysia at Stadium National, Bukit Jalil on 22nd June 2013 (Saturday). Their release the new category of the concert’s seating plan on both beside VIP category, which is CAT 5 (Fixed Seating). Now, the CAT 5 (Fixed Seating) on sold 6th June 2013 (Thursday), start 10 am, with the price RM 458 excludes processing fees, RM 3. This CAT 5 is available on RedTix and TicketCharge outlets, or by online. 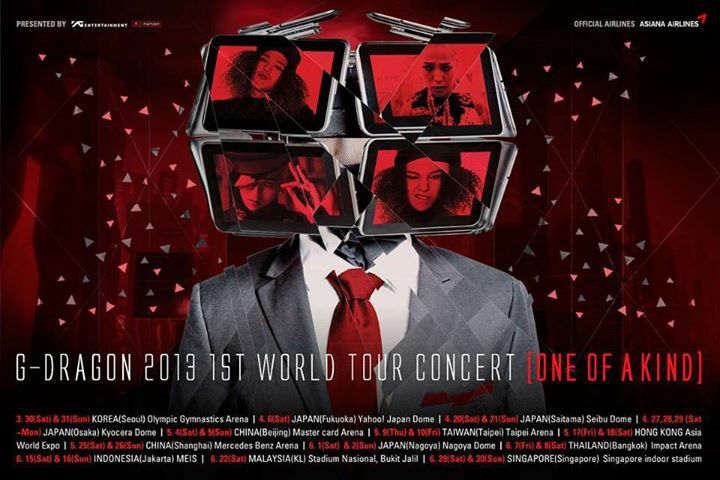 The ticket of G-DRAGON 2013 1st WORLD TOUR CONCERT: One of a Kind Live in Malaysia – only available for CAT 2 X Zone (Free Standing), CAT 4 (Free Standing) and the latest is CAT 5 (Fixed Seating). CAT 1 VIP (Fixed Seating) and CAT 3 (Fixed Row Seating) are already sold out. Hurry Up!! Grad your ticket!! This is the only outdoor concert in G-Dragon World Tour of G-DRAGON 2013 1st WORLD TOUR CONCERT: One of a Kind Live in Malaysia.